Explore the top sights of Jerusalem, visit the Dead Sea and trace the steps of Jesus in Jerusalem on a Super Saver that combines two full-day tours for a discounted price! On the first day, see the main landmarks of Jerusalem and head to the Dead Sea to float in the salt-rich waters. On the second day, walk through Jerusalem, taking in the Via Dolorosa and sites mentioned in the Bible, including where Jesus is said to have prayed before his arrest. Save 12% when you book these tours together! Highlights of Israel Day Trip: Jerusalem and the Dead Sea (Full-Day Tour)Leave your centrally located Jerusalem hotel in an air-conditioned coach and visit the Mount of Olives for incredible views over Jerusalem. Then, pass the Garden of Gethsemane and continue to the city. Enter through the city walls and see the famous Western Wall (Wailing Wall) before walking the iconic Via Dolorosa. Pass the 14 Stations of the Cross and arrive at the site of Jesus’ crucifixion, the Church of the Holy Sepulchre. Next, board your coach and take the hour’s journey to the Dead Sea, the expanse of water at the lowest point of earth. Enjoy two hours to relax on the beach and float in the salt-rich waters, 400m (1,312 ft) below sea level! If you want, finish your visit with a purifying mud bath, covering yourself in mineral-rich mud! On your return journey, pass Jericho, known as the City of Palm Trees, before arriving back in Jerusalem, where your tour ends with a hotel drop-off. 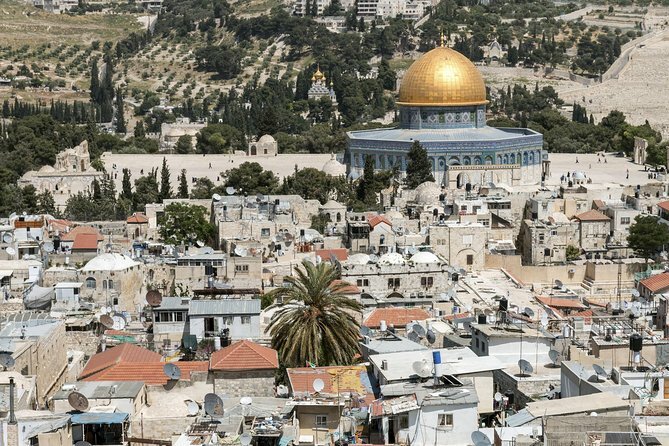 Jerusalem Walking Tour: In the Footsteps of Jesus (Full-Day Tour)Start with a pickup from your centrally located Jerusalem hotel and travel in an air-conditioned coach to the Mount of Olives. Absorb the magnificent city views from here and visit sites mentioned in Biblical stories. Beneath the mountain, visit the Roman Catholic Church of All Nations (Basilica of the Agony) near the Garden of Gethsemane. Admire its mosaics depicting Christ, and see the stone shrine enclosed here, where Jesus is believed to have prayed before his arrest. Pass through the Jewish cemetery in Kidron Valley, and enter the Old City via Lion’s Gate. After a lunch break (own expense), rejoin your guide and take photos of the Pool of Bethesda, mentioned in the Gospel of St John. Next, visit the Crusader St Anne Church, the believed birthplace of the Virgin Mary's mother. You'll then continue to the Convent of the Sisters of Zion, passing pavement games engraved by Roman soldiers. From here, walk the Via Dolorosa, the route taken by Jesus to his crucifixion site, now marked by the Church of the Holy Sepulchre. Finally, return to your coach and end your tour with a hotel drop-off. Entry fees for "Jerusalem Walking Tour: In the Footsteps of Jesus"